The dramatic blue uplighting of this reception, combined with our decision to shoot through candles on the sweetheart table, enabled us to create a memorable first dance photograph during this South Florida wedding. Uplighting has come a long way over the last decade as LED lights have allowed planners, venues, and DJs alike to instantaneously alter the mood of nearly any room. Cool to the touch, LED lights can safely be placed within arms’ reach of inebriated guests without the risk of burns associated with the older incandescent versions. The canisters used for uplighting effects like the one seen here contain hundreds of small LEDs which can be adjusted to produce nearly any color on the spectrum. Emitting light in the three primary colors of red, blue and green, different combinations of colored diodes can create secondary and tertiary colors, as can gels placed over the top of the pure white lights. Being a primary color, blue is easy to produce but many need to be altered slightly to show up as powerfully as it does here, based on the preexisting color of the walls. 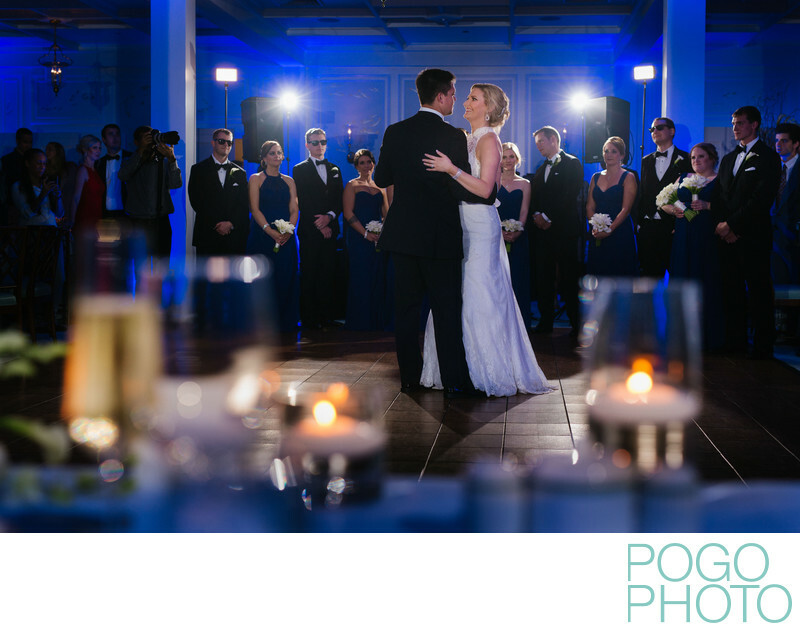 We like to be prepared for anything during a wedding reception and our lighting configuration allowed us to capture this lit image while not overpowering the distinctive blue colored lights on the walls. We use remotely triggered off-camera flashes, strategically placed near the corners of the action, to cast light on our subjects without allowing it to spill onto surfaces we would prefer to remain untouched. Set to a low power setting, the bursts of light emitted from our flashes is unobtrusive to the guests, which we know is very important. Instead of creating a ton of extra light, we adjust our camera settings to make the most of the small amount we produce with the remote flashes, allowing any additional light that already exists in the room to also be visible in the images. Two of those flashes are visible in this photo, but the glow of the candles and cast of the blue light on the walls is what really stands out. This lighting technique provides rim lighting around the guests and the couple, and creates shadows on the floor that provide subtle leading lines that casually guide your eyes around the image. An additional, unseen flash kisses the bride’s cheek and softly lights the faces of the guests behind them, illuminating the scene exactly the way we want it without distracting guests or eliminating the effect of the uplighting. We were very happy we had our lighting fully under control, since we had no idea the lights were going to be blue. In fact, the entire room had an amber glow similar to that of the candles for the duration of the evening except for a brief time during this one song. The sudden change in color elicited some “oohs” and “ahhs” from the guests and impressed us at the same time, since we are usually privy to all of the gems hidden in the wedding day’s timeline. This one was kept a secret from everyone including us, although that was unintentional as the couple simply forgot to tell us about it ahead of time. Em used a wide angle lens to capture the scene while Steve stayed zoomed in on their faces, now bathed in cobalt. Em’s choice of a slightly low angle brought the table setting and candles into the bottom of the image, framing the dance floor in a creative and unique way. The blue hue was switched back to amber as quickly as it had arrived, but we were able to capture this timeless image during that short span. Location: Hillsboro Club, 901 Hillsboro Mile, Hillsboro Beach, FL 33062. 1/200; f/2.8; ISO 800; 50.0 mm.